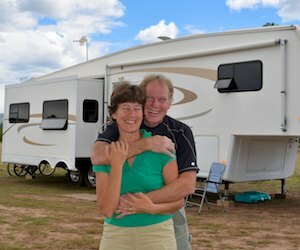 Summer RV Fun in New York and Virginia – in Motorhome Magazine! In the last few months we’ve published two feature articles in Motorhome Magazine. In the May, 2017 issue we told the story of our RV adventures in the Finger Lakes region of upstate New York. The long and narrow “finger” shaped lakes in Upstate New York run on a north-south axis and are absolutely beautiful. 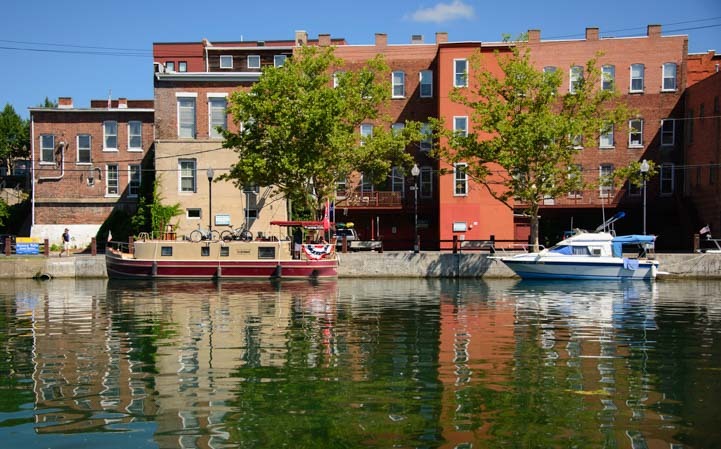 In the town of Seneca Falls we discovered that boaters can tie up at the docks right behind the town center. What a fun way to travel in this area! Boats tie up at the docks on the back side of Seneca Falls. 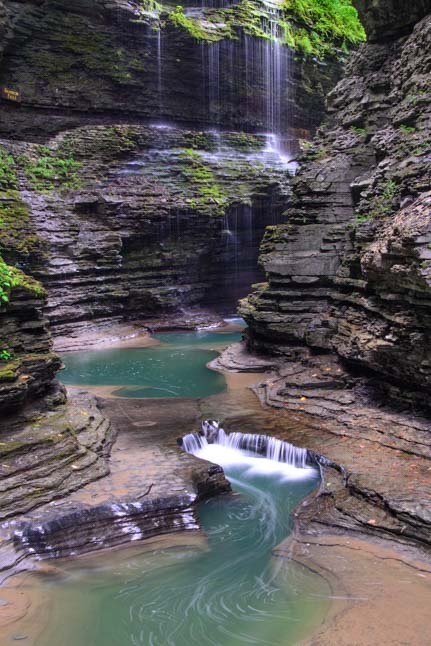 As we wandered throughout the Finger Lakes we discovered the area is rich with waterfalls. 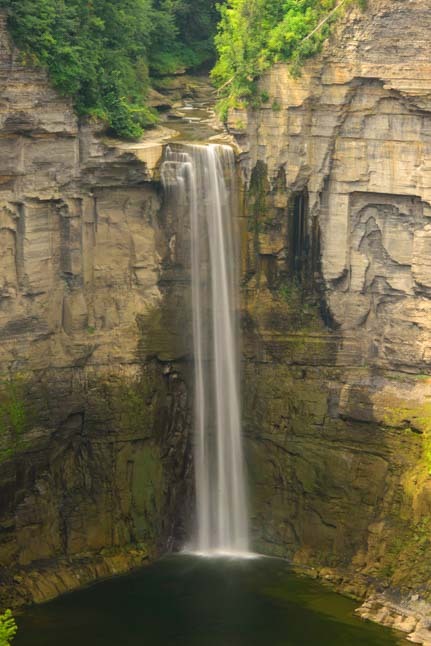 One of the most notable is Taughannock Falls which drops 215 feet down a sheer cliff. People can enjoy these falls from a viewing area right across from them. The Finger Lakes are very rural, and we were surprised to see quite a bit of wildlife in New York that wasn’t the urban, human kind. One of the most unusual animals in the region is the White Deer. What a wonderful surprise it was to look out the car window and see one staring at us! 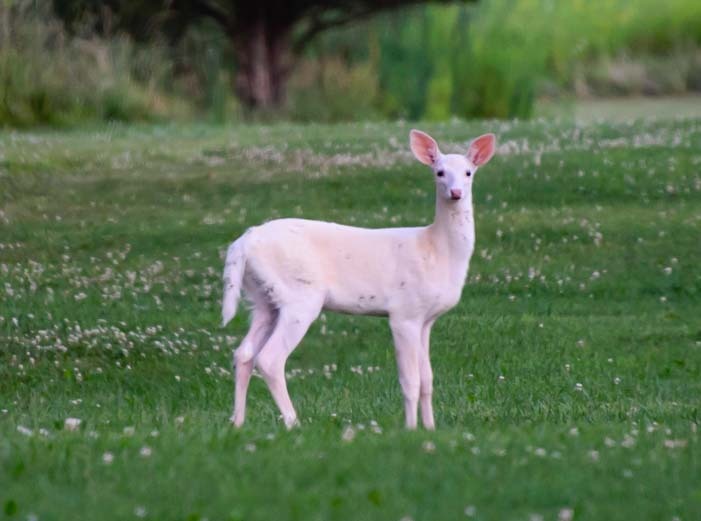 There are white deer in the Finger Lakes and we were lucky enough to see one. We were also very surprised to learn that this area has a good sized Amish community. Unlike the Amish communities in other parts of the country that we have seen, this one is not commercialized for tourists at all, and their pretty farms dot the landscape, providing an evocative reminder of what America looked like back when small family farms filled the countryside everywhere. 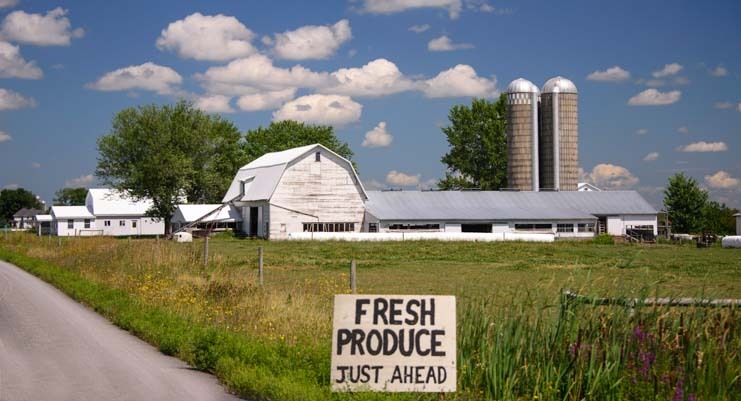 Amish farms throughout this region give a feeling of what America used to be like years ago. 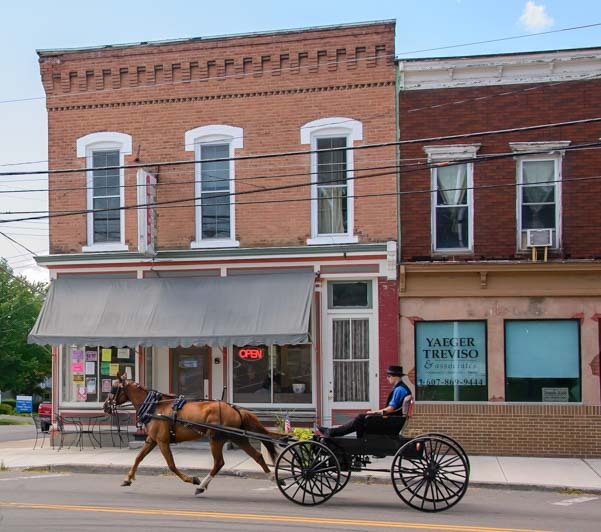 Hearing the clip-clop of the horses’ hooves as they pulled the Amish buggies around town added a unique twist to the area. Four hooves in the air – Amish buggies clip-clop all over the place. The Amish raise crops and sell them at the Seneca Produce Auction, and we were very fortunate to stop in and witness this unusual event taking place. The Amish farmers sell their produce at the Seneca Produce Auction – Fascinating to watch. I had heard about Watkins Glen many times, but when we went there — on a rainy day — we were blown away by the beauty of the many waterfalls and cascades that fill the park. I was so impressed with the magical images throughout this park that I made it the subject of my May, 2017 “Roads to Adventure” column on the back page of Trailer Life Magazine entitled, Take the Plunge! Watkins Glen waterfalls were stunning on a rainy day. 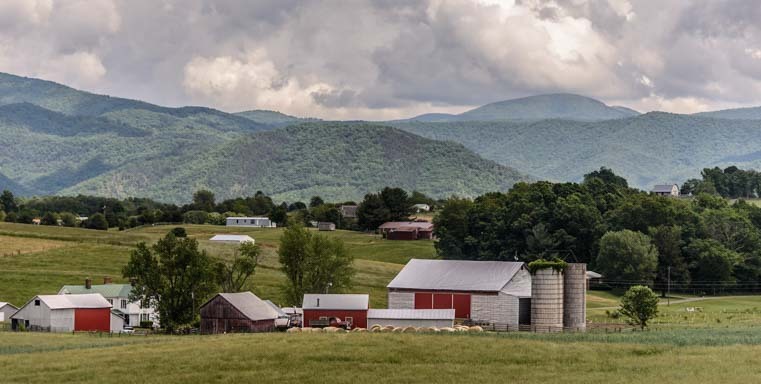 On our drive between the Finger Lakes of New York and the Blue Ridge Parkway in Virginia, we passed lots of beautiful farms. We saw lovely, bucolic scenery on the back roads of the eastern states. 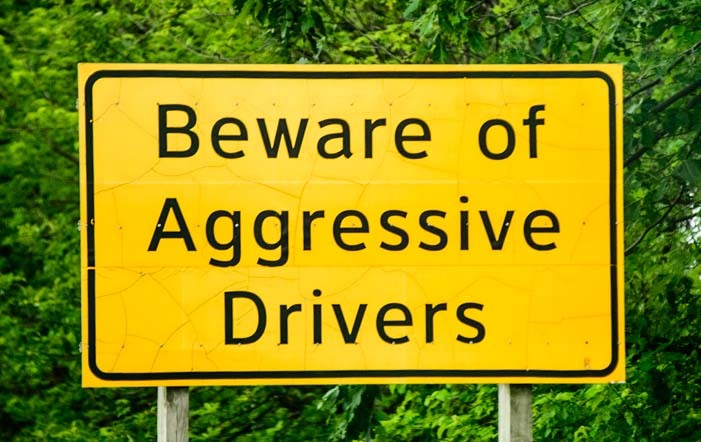 A great reminder for laid back RVers who haven’t driven on roads in the eastern states for a while! 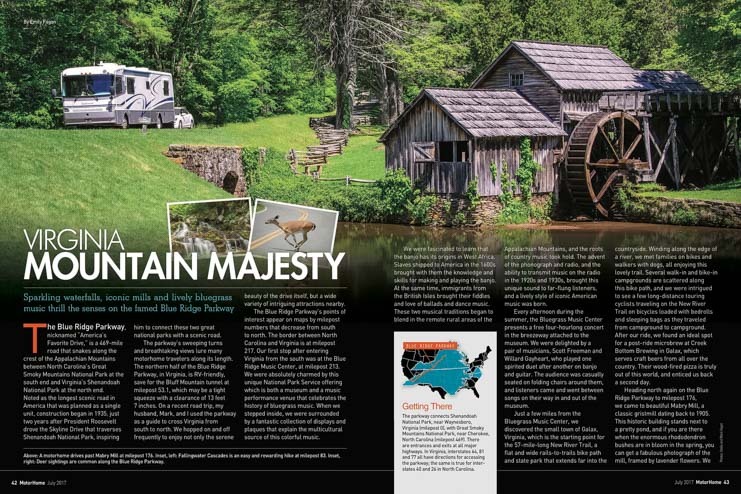 The July, 2017, issue of Motorhome Magazine features our article about some of the highlights we found along the Blue Ridge Parkway in Virginia. One of the most iconic images and most photographed places on the entire Blue Ridge Parkway is the Mabry Mill. The tour of the inside of this century old grist mill was fascinating. We saw how lumber can be milled and grains can be ground by harnessing the power of water flowing over a paddle wheel. 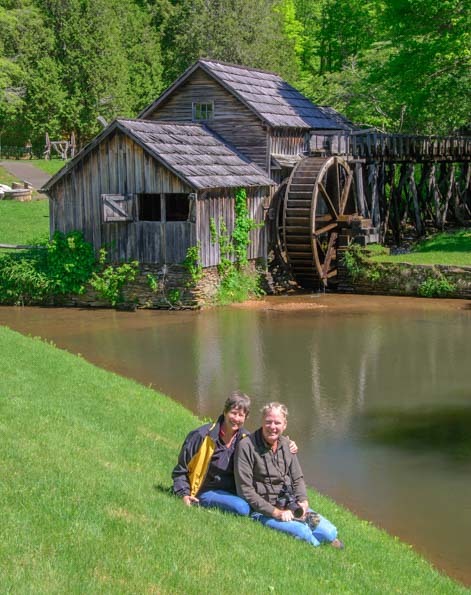 Beautiful Mabry Mill is one of the most photographed spots on the whole Blue Ridge Parkway. Great for a selfie! 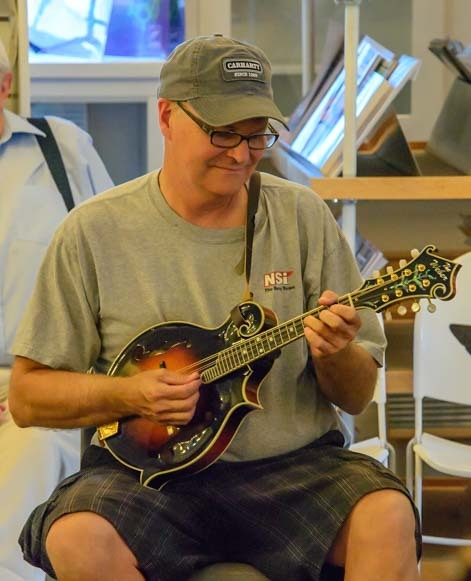 The Blue Ridge Parkway passes through the heart of Bluegrass music country, and we found several venues where we could listen to a lively bluegrass jam for free. One of these was at the Floyd Country store where a huge room was filled to overflowing with musicians playing their hearts out. What fun! There are free bluegrass jams everywhere in the Appalachians, and we found a great one at the Floyd Country Store. 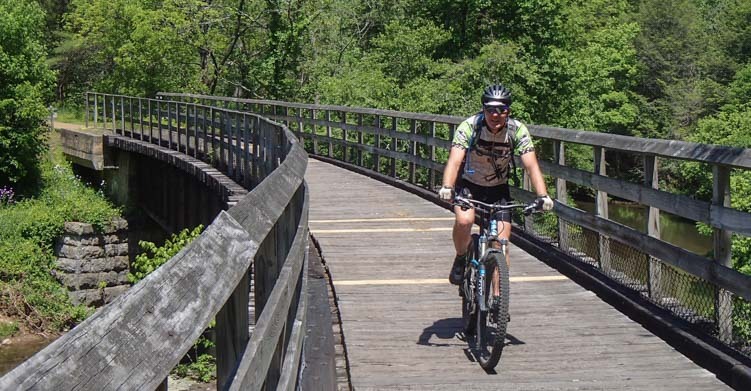 In Galax, Virginia, we discovered the New River Trail, a fantastic rails-to-trails path that is beloved by walkers, joggers and bicyclists. It is a long enough trail that we met people who were taking multiple days to bike the whole route, camping at trailside campgrounds along the way. The New River Trail is a wonderful rails-to-trails path in Galax, Virginia, and they have an awesome brewpub too! 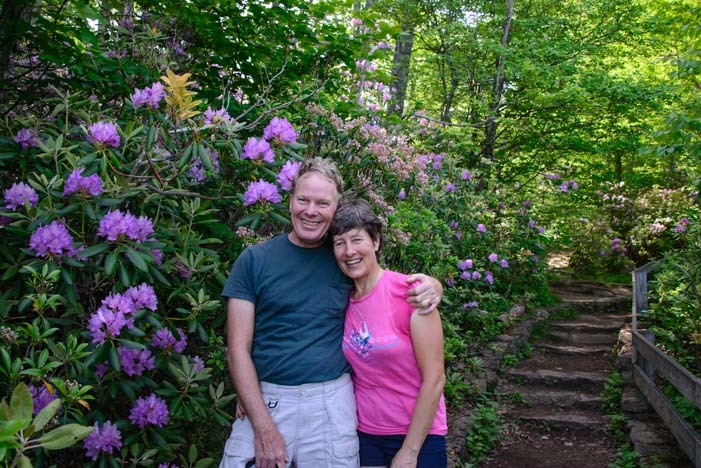 Fall is the most popular time to visit the Blue Ridge Parkway, but we made our trip in the springtime when the mountain laurel and wild rhododendrons were in bloom. I remember carefully planting and watering several rhododendron bushes in my garden years ago. How cool it was to see enormous rhododendron and azalea bushes filled with flowers growing wild all along the route! The wild rhododendrons were beautiful — and we hadn’t known they grew wild in the Appalachians! 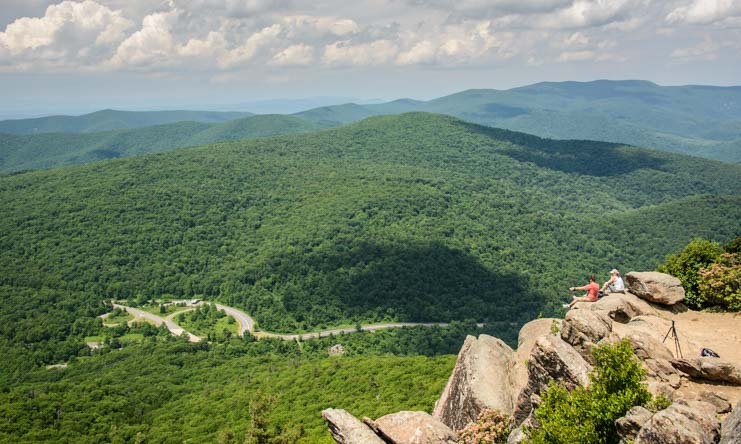 Shenandoah National Park is the crown jewel at the northern end of Virginia’s Blue Ridge Parkway, and we did a hike up to Mary’s rock where we could take in the immense verdant views to the distant mountains. Motorhome Magazine is a terrific magazine for RVers, and we are very proud to be contributors. Although there is tons of information about RVing on the internet, there is a lot to be said for the info provided by a magazine that is professionally edited and produced. Unlike a blog or video that is home grown, like this one, the editorial staff at magazines like Motorhome and Trailer Life includes quite a few people, and the text is scrutinized and critiqued from many angles. The discussions I’ve had with editors about my many technical articles in these magazines have been fascinating, and it has been wonderful to hear other points of view before the final stamp of approval has been given to my manuscripts. When we first started RVing, before we began our RV adventures, we subscribed to every RV magazine we could find, and we learned a lot in the process. If you are new to RVing, we highly recommend getting a subscription and checking it out. And if you’re already a seasoned RVer, there are lots of tips and tricks and interesting travel destinations featured in each issue that might give you new ideas and inspiration! Subscribe to Motorhome Magazine here. On top of the world at Mary’s Rock in Shenandoah National Park. Absolutely an AWESOME commentary on a beautiful part of our Country. The pics you took of the Falls are terrific. Thanks for sharing Mark and Emily. Thank you, Rick!! It is so much fun to write up these tales from all over the country. We are really blessed to live in such an incredible place. Congrats, Emily and Mark, on your MOTORHOME articles 🙂 Great that you can share your travels with this receptive audience ! Thank you! We are very fortunate not only to be able to travel as we do but to be doing it at a time when we can share our experiences both online and in various magazines!! Beautiful upstate New York! And the first 4 of us boys were born in that area, Olean and Cuba NY! You are giving us some ideas, and each day I come closer to either retiring for real, or just taking some summer time off and doing some trips. I am thinking of just taking the Jeep and a tent and some supplies….Ursula said I will be going alone! Retiring for real is a really fun way to go, Pete! If you go to the Finger Lakes, Ursula might enjoy the winery tours. There is a winery every quarter mile down every road (except in Amish country)!! The last time we went across upstate NY I noticed there were fewer dairy farms and a lot more wineries! Personally, I’d prefer the wineries, having spent a good amount of 3 summers on the dairy farms! Wine is big business there, that’s for sure. There are still a lot of dairy farms, but I suspect there’s more money per acre in wine! !